Abebe Bikila, (born August 7, 1932, Mont, Ethiopia—died October 25, 1973, Addis Ababa, Ethiopia), Ethiopian marathon runner who won a gold medal and set a world record while running barefoot at the 1960 Olympic Games in Rome, then bested his own record at the 1964 Olympics in Tokyo. He was the first athlete to win two Olympic marathons. Abebe Bikila was born in the North Showa region of Ethiopia, in a village called Jato. In his youth, he was noted as a good swimmer, Guna player (a type of hockey played during Christmas), and a skillful horse rider. At the age of 17 he moved to the capital city, Addis Ababa, where he began a military carrier in the imperial bodyguard regiment. To keep the troops physically fit, the army unit had regular sport activities. This program gave him a chance to develop his natural talent for sport. Later on as a symbol of unity the armed forces established a yearly sport competition event, which was designed to reunite the three forces, army, air force and navy in shared activities. In his first Annual National Army Athletic competition he finished a marathon in 2 hours 39 minutes and 50 seconds. That opened a new chapter in his life. He was noted by the Swedish coach Onni Niskanen who was then a director of athletics under the ministry of education and later an official of the Red Cross. With the assistance of Niskanen, Bikila began intensive training for the 1960 Rome Olympics. 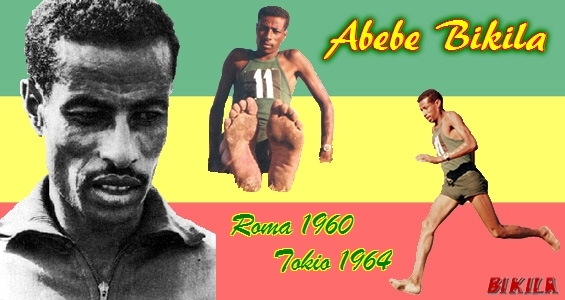 Abebe Wakijera was the only other Ethiopian athlete who qualified to go to Rome besides Bikila. Just days before the competition Bikila developed a blister on his foot due to running with new shoes that did not fit properly (Adidas was low on stock when they got to him). Some journalists had claimed that he used to train barefoot, but this was not true. He decided to run barefoot only as a result of the inconvenience of the blister. Sergei Popov of Russia, who was the world record holder, Abdesselem Rhadi of Morocco, who won an international marathon that same year and another notable, Barry Maggee, of New Zealand were among the participants and the favorites to win the race. Bikila was completely unknown from a country with little Olympic presence. The race began at Campidoglio Square. Abebe kept running close but was not in the leader pack until they approached the 10 kilometer mark. By the 15 kilometer point, he had gained momentum and joined the leaders. By then the competition came down to four people : Rhadi and Arthur Kelly of Britain in the lead, shadowed by the Belgian Van den Dreissche and Abebe Bikila. At the 20 kilometer mark Bikila and Rahdi were running side by side leaving everybody behind them. They passed the 35 kilometer mark running neck and neck. With 1 kilometer left, Bikila drew away. The distance between the two front runners gradually grew. Running strongly Bikila finished the race with a new record time of 2:15:16.25 improving the previous record, set at Helsinki in 1952, by about 8 minutes. Bikila became the first sub-Saharan African to win an Olympic gold, ushering in an era of dominance by east African distance runners. I remember it vividly, including being amazed at watching him do exercises just off the track by the finish line at the end of the race as if he were fresh as a daisy. In 1961, Bikila ran marathons in Greece, Japan, and Czechoslovakia, all of which he won. He entered the 1963 Boston Marathon and finished in just 5th place—the only time in his career that he finished a marathon and did not win. He did not compete again until the Addis Ababa marathon in 1964 which he won in 2:23:14. 40 days prior to the 1964 Summer Olympics in Tokyo, during a training run near Addis Ababa, Bikila started to feel pain. Unaware of the cause of the pain, he attempted to overcome it but collapsed. He was taken to the hospital where he was diagnosed with acute appendicitis. He was operated on and shortly thereafter he started jogging in the hospital courtyard at night. The Tokyo marathon (which, like the Rome marathon, I still remember vividly), started with 68 world class athletes. Immediately Ron Clark of Australia and Jim Hogan of Ireland took the lead. Bikila stayed close. At the 20 kilometer mark he took the lead and slowly opened a gap between himself and the other frontrunners. He won the race with a record time of 2:12:11.2 improving his own record time in Rome. After finishing the race, as in Rome, he went through a series of vigorous exercises as if he were getting ready to start another marathon. In a news conference after the event Abebe predicted that he would win in the 1968 Olympic in Mexico City. While training before the 1967 Zarauz competition Bikila hurt his leg. He competed in the race but failed to finish the course. He was sent to Germany for the necessary treatment by the emperor. But the discomfort in his leg recurred during training. In Mexico City Bikila was confident of winning a third gold medal in part because the altitude was similar to that of Addis Ababa, and would affect other runners more than he. He started in the leading pack running ahead most of the way. But his leg injury flared up. As the pain became unbearable, he decided to leave the competition. It was reported that he encouraged Mamo Wolde who was in the race by saying, “I cannot continue running because I am seriously ill. The responsibility of winning a gold medal for Ethiopia is on your shoulders.” At the 15 kilometer mark Bikila dropped out of the race. Wolde took the lead, running alone with little competition from the rest of the athletes, and finished the race in first place in 2:20:26.4. In 1969 while traveling from his home town, Abebe had a tragic car accident. Because he could not be treated effectively at the local medical facility, he was sent to the Stoke Mandeville hospital in England. He was originally paraplegic but after 8 months of treatment he recovered use of his upper body. As soon as he was able he began physical training to enhance his upper body strength. Two years later, in 1971, he entered a paraplegic sport competition in England in archery, finishing seventh out of one hundred. In that same year he participated in the International Paraplegic Games in Norway. He competed in a dog sled race and finished first. In 1972, Bikila was invited to the Munich Olympic Games as a special guest. He was received with a standing ovation as he entered the stadium in a wheelchair. In honor of his fortieth birthday a gala celebration was held at the Olympic village in the presence of athletes and officials of the organization. Bikila died In 1973 October 20 at the age of 41. An estimated 75,000 mourners attended the state funeral, including members of royal families, and ambassadors, as well as local and international reporters. Related Post "Remembering our Marathon Hero Abebe Bikila !"